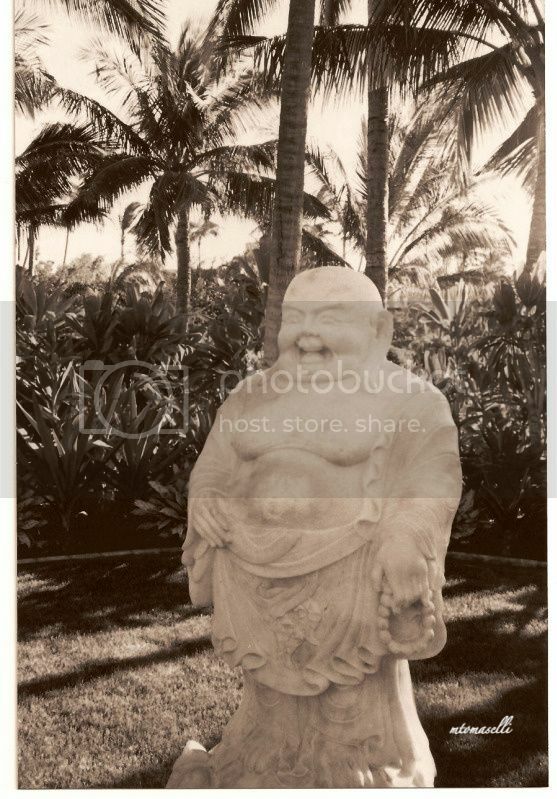 My Sepia Scenes post for today features "The Laughing Buddha" standing in a garden in Hawaii in 1990. I took this shot with a Pentax SLR film camera. Budai (Chinese: 布袋; pinyin: bùdài), pronounced Hotei in Japanese, is a Chinese folkloric deity. His name is Chinese for Calico Bag, after the bag that he carries. He is almost always shown smiling or laughing, hence his nickname in Chinese, the Laughing Buddha (Chinese: 笑佛). In the English speaking countries, he is popularly known also as the Fat Buddha. Budai is often depicted as having the appearance of a fat bald man wearing a robe and wearing or otherwise carrying prayer beads. He carries his few possessions in a cloth sack, being poor but content. His figure appears throughout Chinese culture as a representation of contentment. His image graces many temples, restaurants, amulets, and businesses. However, the "Fat Buddha" is not the historical Buddha, Siddhartha Gautama, and strictly speaking the statue is not an idol. Buddha means "one who has achieved a state of perfect enlightenment" and there are several people who have been given the title. Gautama lived from around B.C. 560 to B.C. 480, it was not until around 127 BC that statues actually depicting him became prevalent. Before that, and still today, statues of the Bodhi Tree and other objects associated with his life were common. Of course by then nobody knew what he really looked like, he was from a noble family and had been described as tall, slender, and of "manly build." Join us in posting for Sepia Scenes, sign Mr. Linky and leave a comment. Oh! First out today! :) Happy SepiaScense to you all! Ironically, Siddhattha Gautama was born a prince -- of a warrior clan no less -- in what became modern day Nepal near the Indian border (and actually a part of India at the time). It was not until after he was married (by arrangement) and fathered a son (which fulfilled his obligation to his father and his wife according to the traditions of the time) that he departed on his quest for perfect enlightenment. And he even adorns black t-shirts. I got one for the DH who is tall and slender and has a bit of a belly. The laughing buddha on the t-shirt invites you to "rub my belly". And a happy photo it is. I appreciate all the time and effort you put into hosting your meme's each week. I have a little something for you today. awww thats cute :) nice capture! A great choice for a sepia scene, I just so happens that I especially like the Laughing Buddha. Thanks for hosting for yet another week! I have a friend who practices Tibetan Buddhism and his Buddha is definitely the skinnier version. That's beautiful photos! The Buddha is quite a happy one. Thanks for hosting for yet another week! Like your new header! That's cool that you went to Hawaii. It must have been beautiful there. I wouldn't care for the long flight though! 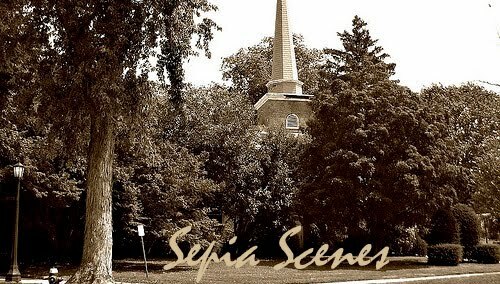 Happy Sepia Scenes, thanks for hosting! I like the Buddha in sepia. I love the quote in your header! That is one I need to remember to put into active use in my life. Love that statue of the Buddha! Love your photo this week! Very handsome in sepia. Have a great day! Mary what a wonderful post! I learned a lot and I love that. I had no idea that Budai was a title. And how amazing is that translation. I would have never known. Your picture is wonderful. I really need to invest in a slr camera sometime. They take such great pictures! Sorry I've been absent from blogging/your memes for a while - had to take a break. The past couple days, I've been helping Eyad with a new blog for his photography.